We constantly strive to work with our network in providing you with direct targeted service For information on our field contact offices please contact us and we would be glad to expedite your needs and offer you our services to resolve and deliver your wants and needs in the Commercial Shipping & Logistic areas. Our Network : all major cities of India. 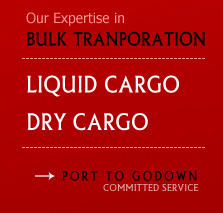 we can deliever your cargo as per your reuqirement and your needs. For any query please mail at "vinayakbulkmoverspvtltd@gmail.com"
Our Corporate office At : Kandla (Gandhidham) INDIA.